With bobile’s easy-to-use push message tool, you can create, schedule, and send push messages. Capture customer’s attention and keep them engaged with updates, incentives, reminders, and promotions. Send relevant messages to all users, or use our targeting tool to create tailormade messages based on user purchases or interests. Send personalized offers to customers and engage them on their birthday, holidays, and other special occasions. Show your customers you care by sharing holiday sales, exclusive deals and special events to build up excitement. 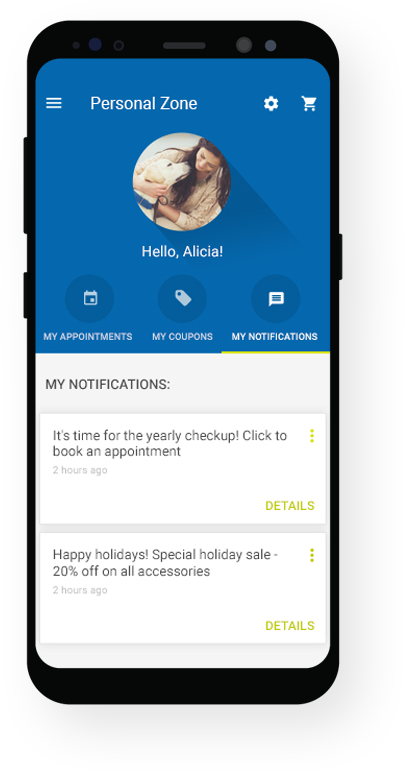 Set default times to send daily/weekly/monthly/annually customized reminders once customers book appointments. Whether you want to remind a trainee to drink water, or that it’s time for their routine checkup, push notification reminders is the best method to do so. Tailor messages and send them at the right time and place. Use marketing personalisation and boost your in-store traffic by sending push notifications to users who are located in the radius of your business location. Let your customers know about seasonal offers and discounts through their smartphones. Share new content and features, news, updates about your business, and more.